I’m still recovering from the lovely night that was Cask Days, the beer event with over 50 beers from around the country to sample. It was also my first ever large scale beer event. It was a LOT of fun and showed that the event, which originally started in the patio of Toronto’s Bar Volo, can attract plenty of folks. People dressed up (two guys even dressed up as hop flowers! ), some decent music was playing and the beers were just…WOW. Before I go in to my pros and cons I have to name off two of my favorite beers from the night. Amsterdam’s “Wee Heavy with Heather Tips” (sweet and comfortable) and Black Oak’s “Black Betty” Dark IPA (the aroma alone is worth getting this beer, but all in all a phenomonal drink). So I’m going to do two things here. First I’ll be going through some notable pros and cons of my experience at the event and then I’m going to go more general and give off some tips I learned at this event and will remember for other events. – Talking with the man from Niagara College’s recently formed brewing school (only brewing school in Canada), finding out the beer they make is VERY tasty and learning that they’d be up for me to pop by for a visit at some point! – Learning about the Pink Boots Society, a group of females in the brewing industry who are setting out to encourage other females to join in on the fun. – Bacon beer by Du de Ciel. Never thought I’d get to try something like that. Bacon beer! Jeez! Was quite smoky and actually tasted like bacon. And to later be told by more than one person that a better one exists in my area…wow. – Talking with other people. Making suggestions, discussing what we’re drinking and what got us in to craft beer…that was definitely a lot of fun. – Being inside Hart House and feeling like I was at Hogwarts. – The names! One of the things I love about one-off beers is the really fun names. My favorite one was “There is No Dana, Only Zuur Sour Ale”. As a Ghostbusters fan it made me cry with joy. – Music got WAY too loud. It became difficult to talk to people over it. – Hart House, while a great place for the event, just didn’t have the lights for it. I would have liked there to have been lights in the sitting areas. – Hipsters were everywhere, but that’s hardly anyone’s fault. – Not enough representation from other provinces. Ontario covered half the area, Quebec got a small table and the other provinces combined got one table. While there was a lot of amazing stuff from the Ontario breweries, and I understand that Ontario laws are silly so they couldn’t get many out-of-province beers, I just would have liked to have seen more brews from other provinces. – Accidentally sitting on broken glass in the bathroom. Ouch. – Walking through the maze that is the University of Toronto campus. These cons are small at best and aren’t really the fault of the organizers. And at the end of the day I’m there for the beer and it was fantabulous. I’ll definitely be attending future events. And that’s pretty much what my experience was. And now THE TIPS. Lessons learned from my first large scale beer event. 1. You don’t need to drink all the beers. Cask Days had over 50 beers available, so it was pretty easy to feel overwhelmed and the excitement of it all made me feel like a kid in a candy store. Next time, I’ll have a lot less and be content with that. 2. Eat something. With all that alcohol around, you’ll need something to eat and the chances that those events will be serving food is really good. Even if it’s something small, just make sure you’re having something to soak all that booze up (I had a veggie burger which hit the spot). 3. Bring a friend. While I had a great time there and ended up chatting with some people, I really can’t shake the feeling that the event would have been better for me if I brought along a beer-loving friend. 4. Be safe. In the good chance that things get a bit hairy and you’re not as sober as you’d like to be, make sure that you have a way of getting home that doesn’t involve a lot of falling down. Do constant checks of your things to see if you still have them. So pretty basic tips, I’ll grant you, but that’s why they’re so effective. So in summary, I had a lot of fun and am really looking forward to going to more beer events! Just an FYI – it is very difficult to bring in Casks that were out side of Ontario. I heard from Ralph (the owner of barvolo) many brewers (outside of Ontario) declined the opportunity to send their beers to the festival. 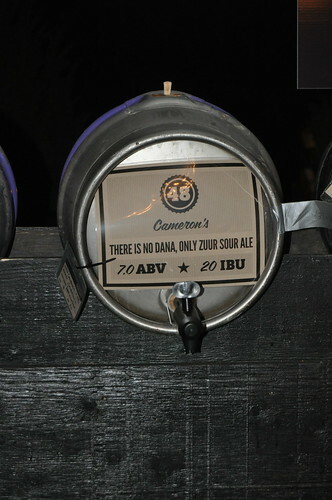 Which is a shame because this is the only national cask-ale festival Canada has got! Overall it was a great festival, hope that the Caskdays team continues to put out these type of events! If you look above, I actually acknowledged that Ontario laws make it very deifficult to get out of province beers over here. Though I didn’t know about many brewers declining. Hrm.